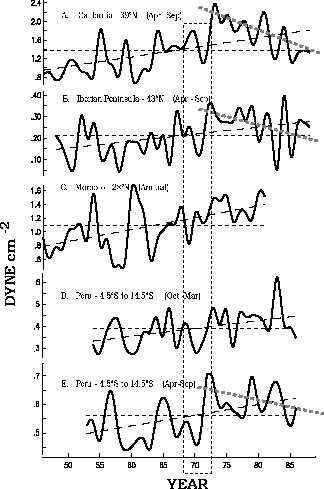 The graphic below is a a summary of Global Scalar Winter Winds from the Comprehensive Ocean and Atmosphere Data set (COADS), for the years 1854 to 1990, for regions summarized by 30 degree latitude integrations. The figures include hatched box reminders for the for recent periods in which the major transitions occurred within the world's Eastern Boundary Currents, leading to recent major faunal shifts. Although the decrease in wind speed implies a general decline in upwelling, most of the naive intertpretations point at a sea surface temperature increase, a consequnce rather than a cause of the processes involved. Note: the period from the mid 1940s to present, is a period of nearly constant upward trends, with far less variation than the preceding century. This is also the period when most of the available ocean and atmosphere observations from somewhat modern technologies were made, and that form our statistical modeling data base. In a 1990 Science article on Global Warming, Bakun speculated that upwelling system productivity would be enhanced, as a greater difference between land and coastal ocean temperatures would induce increased wind speeds, hence greater upwelling. Below is the crucial figure, representing the present status of the major eastern boundary current upwelling regions. Note that they are mostly in decline, and subsequently lower production is general. This is another argument against Global Warming. Enhanced SSTs contribute to declines in biomass through a basic physiological effect, increased respiration rates, and subsequent declines in ecological efficiencies. Energetic throughput may increase dramatically, but less of that energy is bound into biomass, particularly at higher trophic levels. Note that Bakun's 1990 manuscript included only data from the recent 50 year period (see below), and compare that set to the larger period. It is useful to consider that much of the recent instrumental information was obtained during a relatively benign, questionably representative period in climate history. Also worthy of consideration is that the "Little Ice Age" that characterized the period of transition from Feudal to Industrial society began ending in many locations in the late 1700s, and was fully "Globally" reversed by the mid 1800s.